William Kentridge (b. 1955) has won wide international acclaim as a leading contemporary artist working today. In more than three decades, the South African visual artist, filmmaker, and stage director has built a sizable oeuvre that spans a broad range of media including animated film, prints and drawings, theatre productions, and sculpture. Kentridge studied political science and African studies and, later, mime and theatre in Johannesburg and Paris. His first animated film, Vetkoek/Fête Galante, dates from 1985. He subsequently devised a filmmaking technique he calls “poor man’s animation” involving photographs of charcoal drawings and collages. Among his works in this genre is a series of Drawings for Projection (1989–2003), animated episodes featuring protagonists such as the callous capitalist Soho Eckstein and Felix Teitelbaum, whose features suggest a self-portrait of the artist. 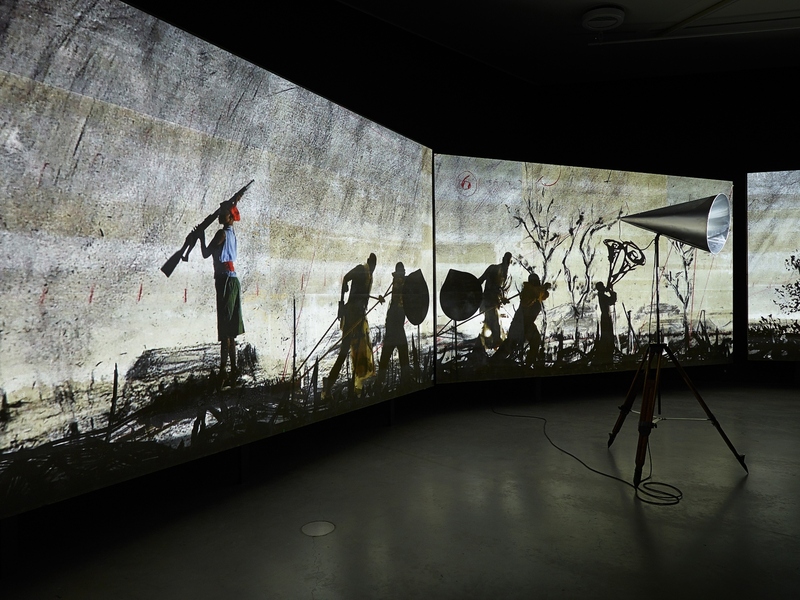 These and other characters as well as topographical similarities to Johannesburg make Kentridge’s films astute reflections on the ambivalent situation of today’s South Africa. In his early films and drawings, the artist directly tackled South Africa’s and Europe’s social and ethnic conflicts. In the 1970s and 1980s, he created posters, drawings, and plays that sharply criticized his native country’s Apartheid regime. The play Sophiatown (1986–1989), produced in collaboration with the Junction Avenue Theatre Company, dramatized the forced removal of the residents of the Johannesburg neighborhood of Sophiatown in 1955. Designed in close consultation with the artist, the exhibition showcases early graphic art and films from the 1980s and 1990s as well as examples of Kentridge’s more recent output, including the first adaptations for museum presentation of elements from The Head & The Load, which premiered at the Tate Modern, London, in the summer of 2018. A sumptuous production involving film projections, shadow play, and an ensemble of performers, the sprawling procession, which defies conventional genre boundaries, sheds light on a neglected chapter of history: Africa’s role in World War I. Taking up three exhibition floors at the Kunstmuseum Basel | Gegenwart, the presentation balances additional major video installations such as More Sweetly Play the Dance and Shadow Procession with selections from Kentridge’s graphic oeuvre properly speaking.